After signing up with Book Blogs, I started receiving emails about books for review and one of them happened to be a 4th-grade level book. 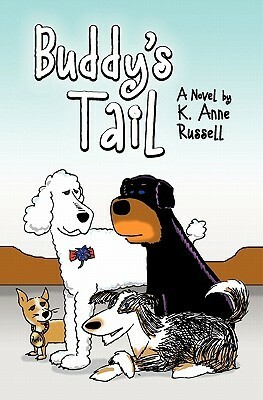 Though I typically stay far away from animal stories (I was traumatized by Old Yeller as a child), I chose to review Buddy's Tail for a couple of reasons. One, I have a niece that will be entering 4th grade in the fall. Two, I can't really remember what I read as a 4th grader, but I sure haven't recognized the titles my niece and nephew talk about. Three, on a related note, I wanted to have a book that I could talk to my niece and nephew about - my niece isn't really into books due to a slight reading disability, but my nephew loves books. I am really glad I chose to review it. It was a really good read. Like I said, I can't really remember what I read when I was their age (I guess this might have been the age I was reading The Bobbsy Twins ). When I received it in the mail. I remember thinking it was kind of long for a children's book (I have adult books that are only 10 - 20 pages longer). I mentioned it Mom (who has worked with kids all her life) and she reminded me that kids are reading Harry Potter at this age. The summary of the book pretty much tells you everything about the book so there were no surprises. I prepared myself for the dogs to die. It was a little sad, but since their story continues after death, it wasn't like they disappeared. Also, there isn't a lot of human interactions to make me feel attached to the dogs on that level. I did get a little teary eyed at the end, but I won't spoil for you. Buddy's Tail would be great to use in a classroom when studying the southwest US as there were many geographically specific references. I was a little disappointed with the stereotyping that Russell used with the dogs. A chihuahua that "speaks" Spanish, lives with a Hispanic family and likes Taco Bell seemed contrite. Maybe 4th graders are assumed by it, but I thought it condoned stereotyping. The book is also good for a vocabulary lesson. I'll admit that I had to look up a couple of terms - granted they were architectural terms. Again, the southwest influence of language was present which would easily lead to discussions of sense of place. Russell has a website with additional classroom tools. The book (which I think this was supposed to be the main point) deals with animal neglect and responsibility of having a pet - lessons a child should learn. This is the fourth reason I wanted to review this book. In the overview that came in the email announcement, it was mentioned that the book was to teach children about animal cruelty - I was curious about how the subject would be handled to be age appropriate. I thought Russell did a good job. I think in the back my mind I thought it might push for vegetarianism or more extreme PETA-like propaganda, but it didn't. Like I said it touched more on being a responsible pet owner. I would recommend this to teachers and parents (it would make a good summer read for all those summer reading programs). For the parents: what are your kids reading? For my readers without young kids: what books did you read as a child?